The Italia Line lost all of their large liners during World War Two. In the early 1950s, they ordered the 29,083-ton Andrea Doria and her near identical sister ship Cristoforo Colombo to build up their fleet. With these two liners, the Italia Line was again established as the premier shipping line on the Southern Atlantic route. 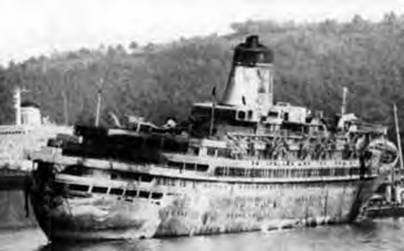 After Andrea Doria collided with the liner Stolkholm in 1956 and sank, the Italia Line ordered Leonardo da Vinci as a replacement. This ship, an improved design of the Andrea Doria class, set out on her maiden voyage from Genoa - New York June 30th 1960. 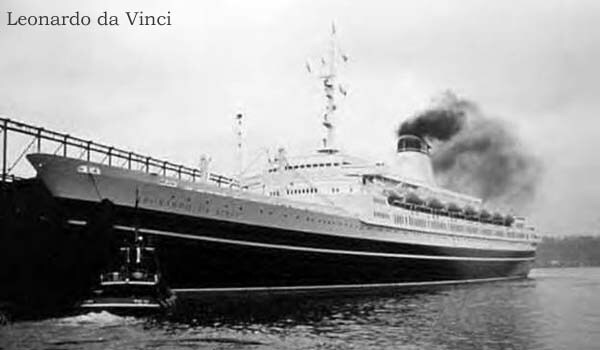 The Italia Line’s 45,900-ton sister ships Michelangelo and Raffaello entered service in 1965. This led to Leonardo da Vinci and Cristoforo Colombo being taken off the Atlantic run to be used solely for cruising. A coat of white paint was applied to Leonardo da Vinci and Cristoforo Colombo before they set out in their new role as full time cruise ships. After 11 years cruising throughout the Mediterranean and Caribbean, Leonardo da Vinci was taken out of service in 1976. At one time it looked like Costa would buy her to be operated on cruises out of Miami. After the Miami deal fell through, rumors began circulating that she would be used as a casino ship moored on the River Thames/London. The failure of these interests to materialize led to her being laid up at La Spezia/Italy next to the scrap yard. On July 4th 1940, Leonardo da Vinci mysteriously caught fire. The fire raged for four days until all that remained was a burned out shell. Amid speculation of sabotage, the wreck of Leonardo da Vinci was towed to the nearby ship breakers to be cut up.